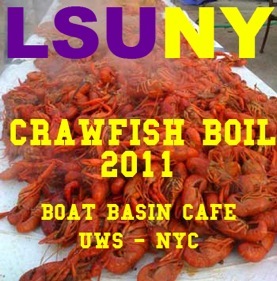 Join the LSU Metro New York Chapter for some good crawfish! Please print out your paypal receipt and that will be your ticket. We will have the list of names at the door, but to ensure that there are no problems please have your ticket available the day of the boil. The boil sold out last year so get your tickets early, there is no guarantee that tickets will be available at the door. Refunds are available until the day before the boil. No refunds will be issued on or after the day of the boil.